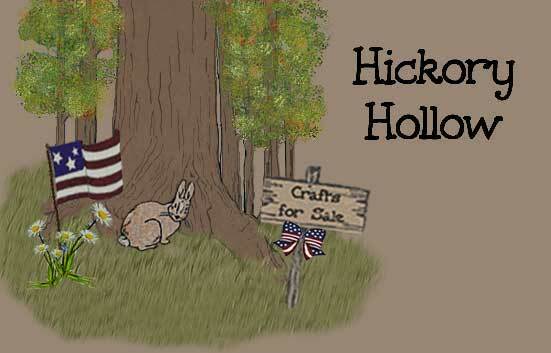 If you love truly unique primitive and country pieces, Hickory Hollow offers you a variety of handmade decorative accessories for your home as well as casual clothing. No two items are ever exactly the same. Choose items and gifts from our Spring and Easter collection on the seasonal page. We also offer dolls and animals, decorative pillows, stitcheries, vintage looking wood crafts, and more -- all created for your country/primitive home. You will receive compliments every time you display, wear or give a gift from our shop. Some sweatshirts are hand-dyed to offer you unusual colors that are not available any where else. We have received numerous inquiries from customers about the beautiful fabric on our pillows and decorated towels. An assortment of this fabric from our collection is for sale in the This 'N That section of our site. Place your order today. Your satisfaction is always guaranteed! We are a small family business with a workshop at the foot of the beautiful Rocky Mountains, shaded by a large old tree and surrounded by the wild bunnies that inspired our logo. A love of primitive and country crafting was inspired by our mother and father. Mother created beautiful crocheted accessories, hand stitched too many quilts to count, and taught us embroidery and sewing. Father made wonderful wooden and stained glass pieces. Our family cherishes these sentimental handcrafted treasurers that were shared with us. Thank you for visiting Hickory Hollow. Please return soon. Email me with any comments, questions or special requests you may have and I will respond within 24 hours.